This article is about the chemicals used to remove leaves. For the animals that eat leaves, see Folivore. For the removal of the oldest dead cells on the skin's surface, see Exfoliation (cosmetology). Defoliants are used as an aid in the harvesting of certain crops such as cotton. 2,4-D, one of the first chemical herbicides used as a defoliant. U.S. Army Huey helicopter spraying Agent Orange over agricultural land during the Vietnam War. A defoliant is any herbicidal chemical sprayed or dusted on plants to cause their leaves to fall off. Defoliants are widely used for the selective removal of weeds in managing croplands and lawns. Worldwide use of defoliants, along with the development of other herbicides and pesticides, allowed for the Green Revolution, an increase in agricultural production in mid-20th century. Defoliants have also been used in warfare as a means to deprive an enemy of food crops and/or hiding cover, most notably by the United States in the Vietnam War. A primary application of defoliants is the selective killing of plants. Two of the oldest chemical herbicides used as defoliants are 2,4-Dichlorophenoxyacetic acid (2,4-D) and 2,4,5-Trichlorophenoxyacetic acid (2,4,5-T). 2,4-D and 2,4,5-T are absorbed by broad-leafed plants, killing them by causing excessive hormonal growth. These phenoxy herbicides were designed to selectively kill weeds and unwanted plants in croplands. They were first introduced at the beginning of World War II and became widespread in use in agriculture following the end of the War. Defoliants have a practical use in the harvesting of certain crops, particularly cotton, in the United States as well as a number of other cotton-producing countries. The use of defoliants aids in the effective harvesting of cotton and finer lint quality. The effectiveness of defoliant use in cotton harvesting depends on the type of defoliant(s) used, the number of applications, the amount applied, and environmental variables. Common harvest-aiding chemical defoliants include tribufos, dimethipin, and thidiazuron. According to a 1998 report by the U.S. Department of Agriculture National Agricultural Statistics Service (NASS), tribufos and thidiazuron accounted for 60% of crop area that was treated by defoliants during that crop year. In 1998, the U.S. Environmental Protection Agency (U.S. EPA) concluded that the use of agricultural defoliants led to increased risks of water contamination and dangers to freshwater and marine life. High doses of tribufos were labeled as a possible carcinogen and a toxin to freshwater and marine invertebrates. Dimethipin has also been labeled as a possible human carcinogen. A published study in the Journal of Agricultural and Food Chemistry reported that through successive surface runoff events in defoliated cotton fields, defoliant concentrations decreased exponentially within the test area and could negatively affect marine life in the runoff zones. Agent Orange, a defoliant used by the U.S. Military during the Vietnam War to defoliate regions of Vietnam from 1961 to 1971, has been linked to several long-term health issues. Agent Orange contains a mixture of 2,4-D and 2,4,5-T as well as dioxin contaminants. Members of the Air Force Ranch Hand and the Army Chemical Corps who served in the Vietnam War were occupationally exposed to Agent Orange have a higher incidence of diabetes, heart disease, hypertension, and chronic respiratory diseases. Among other occupations, farmers are at a significantly higher risk of developing Alzheimer's disease due to a greater chance of defoliant exposure. ^ a b Zierler, David (2011). Invention of Ecocide. Athens, Georgia: University of Georgia Press. ISBN 9786613110404. ^ Snipes, Charles E.; Cathey, George W. (1992). 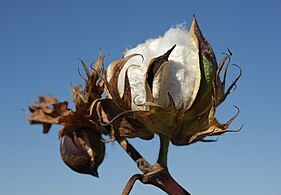 "Evaluation of defoliant mixtures in cotton". Field Crops Research. 28 (4): 327–334. doi:10.1016/0378-4290(92)90018-5. ISSN 0378-4290. ^ a b c Potter, Thomas L.; Marti, Luz; Belflower, Sally; Truman, Clint C. (2000). "Multiresidue Analysis of Cotton Defoliant, Herbicide, and Insecticide Residues in Water by Solid-Phase Extraction and GC−NPD, GC−MS, and HPLC−Diode Array Detection". Journal of Agricultural and Food Chemistry. 48 (9): 4103–4108. doi:10.1021/jf9909104. ISSN 0021-8561. ^ NASS (1999). Agricultural Chemical Usage 1998 Field Crops Summary. Washington, D.C.: U. S. Department of Agriculture National Agricultural Statistics and Economic Research Service. pg 141. ^ Tow Fawthrop (June 14, 2004). "Vietnam's war against Agent Orange". bbc.co.uk. ^ "Agent Orange Linked To Skin Cancer Risk". Science 2.0. Retrieved 17 September 2014. ^ Kang, Han K.; Dalager, Nancy A.; Needham, Larry L.; Patterson, Donald G.; Lees, Peter S.J. ; Yates, Katherine; Matanoski, Genevieve M. (2006). "Health status of Army Chemical Corps Vietnam veterans who sprayed defoliant in Vietnam". American Journal of Industrial Medicine. 49 (11): 875–884. doi:10.1002/ajim.20385. ISSN 0271-3586. ^ Tyas, Suzanne L; Manfreda, Jure; Strain, Laurel A; Montgomery, Patrick R (2001). "Risk factors for Alzheimer's disease: a population-based, longitudinal study in Manitoba, Canada". International Journal of Epidemiology. 30 (3): 590–597. doi:10.1093/ije/30.3.590. ISSN 1464-3685. Wikimedia Commons has media related to Defoliants.